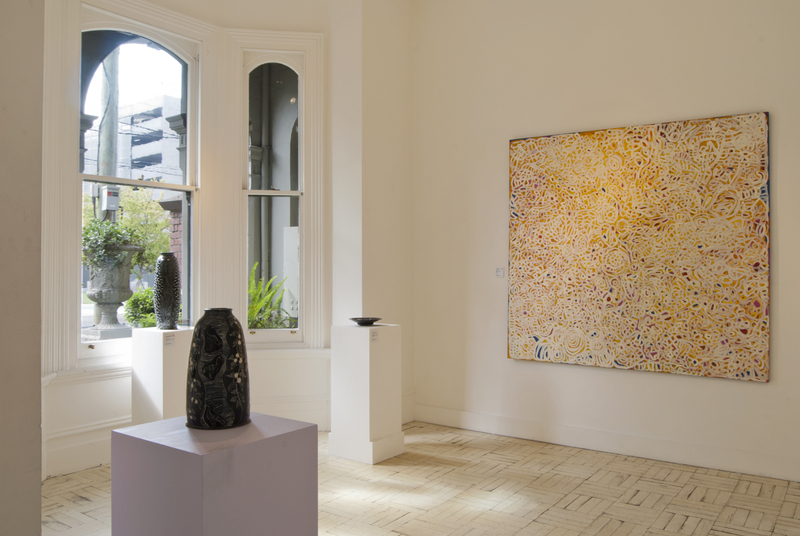 Installation view of Alcaston Gallery, Melbourne. All images courtesy of the Artist, Ernabella Arts and Alcaston Gallery, Melbourne. While walking the Fitzroy Aboriginal Heritage Trail I found Alcaston Gallery located at one of the heritage sites. A contemporary art gallery, Alcaston specializes in indigenous art and supports over 200 artists in total. The gallery places Aboriginal art within a wider Australian context, avoiding the common error of ghettoizing indigenous paintings to a special tribal room at a natural history museum. The work isn’t an artifact to be studied – it’s a modern expression of a living artist to be experienced. On the day I visited, the well-curated space burst with sunlight and brightly displayed pieces that stopped me cold. “Our Country” – a massive painting by Sally Gabori in collaboration with her two daughters Amanda and Elsie – left me breathless. The exhibition of works by Dickie Minyintiri, Pantjiti Lionel, and Derek Thompson gave me a sense of hopefulness and light – a celebration, though likely born of difficult journeys. The paintings should speak for themselves. They should, but they don’t always get the chance. As with most fine art, the space around them makes all the difference. I’ve been disturbed by the curation of Aboriginal work here in Australia. Most of it is relegated to “arts and crafts” status. A bookmark here, a mug there. Of the work that is taken seriously, too much of it is set aside as history, even when the work is contemporary. Or it’s included in a contemporary collection, but labeled “Aboriginal” and kept in a separate room. People don’t tend to go to those rooms as often; the special branding suggests the paintings don’t belong with the rest, that the works are perhaps undeserving but necessary to include out of political correctness. In reality, the indigenous work I’ve seen is more moving and thoughtful than anything I could have hoped or imagined. 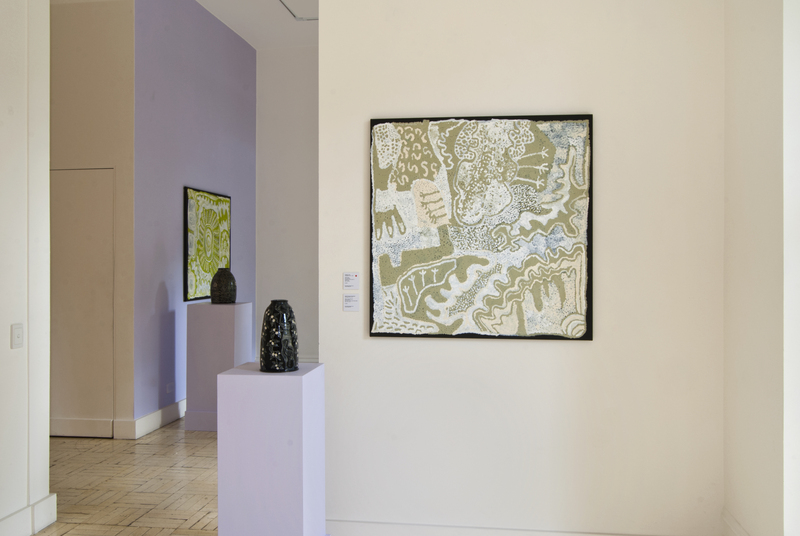 Galleries like Alcaston treat it with the attention and respect it deserves. In response, I hope art lovers will do the same for Alcaston.